In honor of M4P friend Gene Ha’s new Mae Graphic Novel Kickstarter campaign, we are going to feature Gene’s ideas for the next 4 weeks. 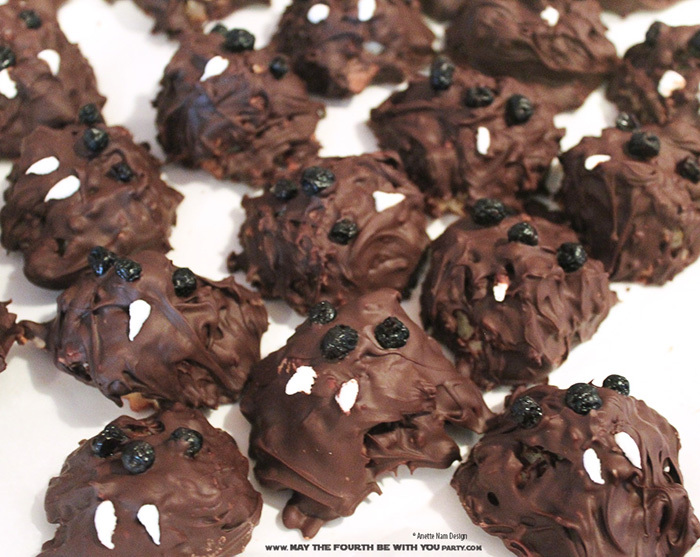 First up, the M4P exclusive Wookiee Cookies. Do you what works beautifully though? This recipe. Coconutty, chocolatey goodness all in the shape of a friendly Wookiee. Most definitely one of the yummiest things we have ever featured. Combine the coconut, egg whites, sugar, flour, salt, and vanilla in a bowl. Microwave chocolate in small bowl. Dip the TOP of each macaroon in the chocolate and place back on the parchment-lined baking sheet. Add raisins for eyes and nose while the chocolate is still soft. Add 2 small icing triangles for teeth. You can find the macaroon recipe these Wookie Cookies are based on here at Real Simple.com.